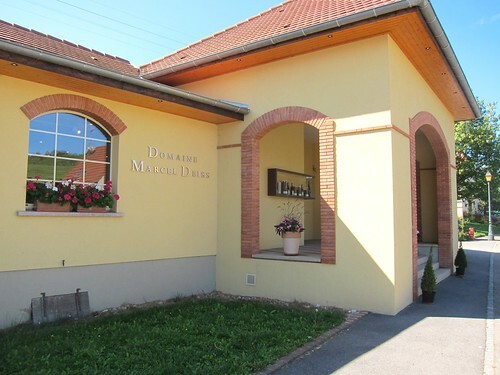 Since we already were in Bergheim, a visit at the legendary Domaine Marcel Deiss was kind of a must. Luckily, their tasting room is open on saturday mornings and we were probably the first to arrive at about 11 am, making for a very warm welcome at the estate. Now if you don’t know why this estate is so unique, here’s a quick explanation. In the 1980’s Jean-Michel Deiss -nowadays (as football coach José Mourinho) one could call him “the special one” – decided to go his own way regarding Terroir philosphy. His belief is that the best method to catch the uniqueness of a place is through coplantation of grape varieties, the way it was hundreds of years ago. This philosphy goes totally against today’s common practice by nearly all quality winemakers to adapt one varietal to express Terroir, like for example Pinot Noir in the best vineyards in Burgundy or Riesling in the best parcels in Germany. It is the so-called single varietal system. The idea behind coplantation is: if you have a few different vineyards in – let’s say Alsace-, having them all planted with the same wild mix of varietals, one might much be better able to see the differences that stem from the particularity of the place, leaving out the boundaries of ripeness and aromatics attached specifically to only one varietal. I have to say that the whole concept isntantly made sense to me when the tasting room manager (whose name I omitted to note down) explained it to us. How come I didn’t think of it earlier? A fascinating story it is. And very fascinating are also all details about co-planting. Nowadays, all used single varietals are results of crossing and further crossing in order to get the best possible expression of a grape, some would even call it manipulation. 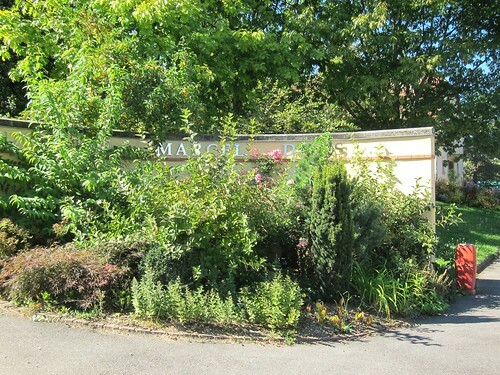 Now, if you just leave the vines on their own for a couple of years, they’ll naturally cross with each other and will start to develop back to ancient varietals that seemed to be lost. And it’s these kind of varitetals that Jean-Michel Deiss is looking for in his vineyards. Ok, this might seem like a really naive explanation to you – but I guess it really works a bit like that! Or at least I hope that what I’m transcribing here is accurate enough. Even more fascinating is the fact, that after some 6 to 7 years, all these different varietals that are coplanted in the same vineyard are starting to budbreak, flower and ripen at the same time. Now that is incredible! And how could the expression of Terroir come in a more natural way? Also, the estate leaves all grape juices to ferment at their own pace, using only the wild yeasts that are beig collected from the vineyard and filtered out of the juice. Fermentation is going on in hermetically closed vats in order to prevent from oxidation. Still a very natural way. So now the question is: how do all these wines taste? And I’m affraid I didn’t take any detailed notes, but I can tell you it is pretty much antipodal from your usual single varietal wine. They all appear to be multi-layered, and depending on vintage and vineyard sometimes one grape is more pronounced or sometimes a little sweet edge is present. Here and there a note of Gewürztraminer is coming through, sometimes there’s a botrytis accent, then some have a slight rosé shine in their robe. But still, and quite interestingly actually, all wines seem to be balanced in their apparent heterogeneity. 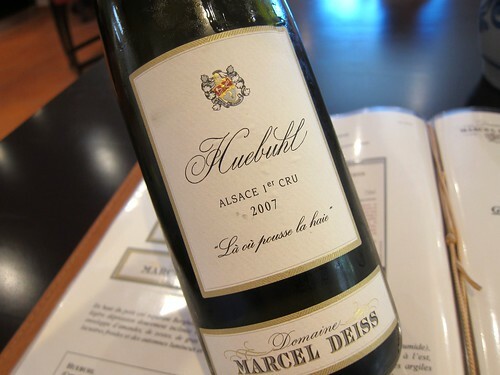 A natural harmony seems to be inherent to all of Deiss‘ wines. I will make sure to post some detailed notes on this blog in the coming months, since I brought back home a couple of bottles. 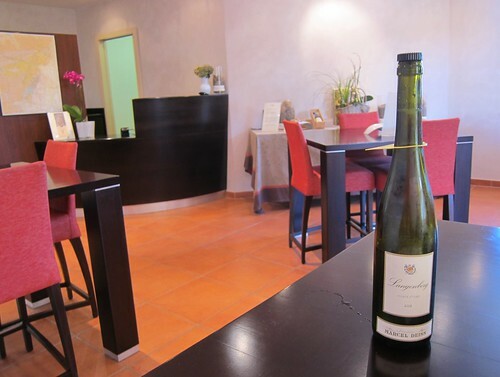 In the meantime, I can truly recommend stopping by the Deiss tasting room while you’re travelling through Alsace. They take a small cover charge for tasting the wines, but it is redeemable in case of a purchase, and even if you don’t buy any bottle, it’s truly worth it. The name Deiss is dutifully noted. 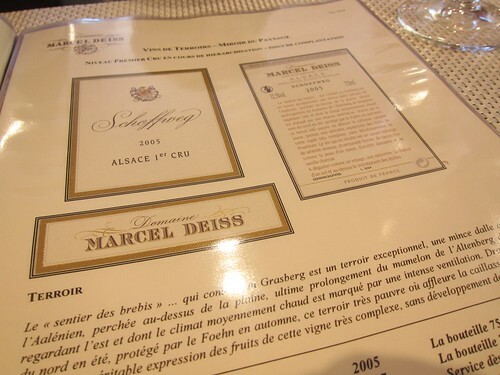 The concept does sound worth exploring and I vaguely remember having seen Deiss on menus in London restaurants,so perhaps I will soon get a chance to try one!